Updated for the new AP® Latin Examination! Pearson is proud to announce the publication of the updated edition of A Song of War. 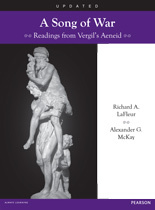 Written by Richard LaFleur, this highly acclaimed textbook introduces intermediate and advanced Latin students to Vergil’s Aeneid and has been updated for the new AP Latin Examination first being administered in May 2013. 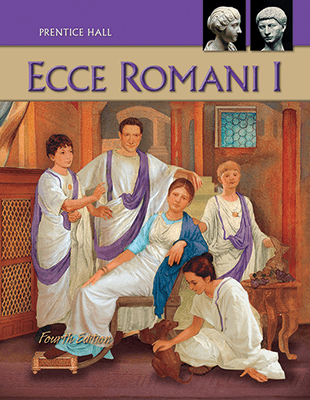 This updated version contains all the readings on the Advanced Placement® Latin Examination, and are comprised of additional selections from Books One, Four, Six, Ten, Twelve as well as Book Two in its entirety. glosses for unfamiliar vocabulary, difficult grammar, and problematic word order, as well as interpretive remarks and comments on figures of speech, meter, sound effects, and other poetic devices. Accompanying the notes are discussion questions on theme, structure, figurative language, metrical effects, and other topics with which intermediate and advanced students are expected to be familiar. The introduction provides an overview of Vergil’s life and works, a discussion of his style and meter, a detailed explanation of scansion, and a glossary of figures of speech and other poetic and rhetorical devices (in particular those found on the AP® syllabus), with references to examples found in the text. Also included are introductions to the individual books, numerous illustrations, maps, an end vocabulary, and grammatical appendices. The Student Companion Web Site, accessed at PearsonSchool.com using a Student Web Code, features links that connect students to more information and resources related to Vergil’s Aeneid. Accompanying A Song of War is a Teacher’s guide with extensive discussion and teaching tips, sample questions in the AP®format, and literal translations of all selections. The Teacher’s Companion Web Site, accessed at PearsonSchool.com using a Teacher Web Code, includes a variety of online resources including: bibliography, vocabulary frequency list in descending order, text enlargements, and links to other online resources to enhance teaching Vergil’s Aeneid.